Valves are very large and highly arched. The dorsal margin has 9 to 16 bluntly pointed and evenly spaced undulations. The ventral margin is concave and follows the same curvature as the dorsal margin. Valve apices are about the same size and shape as the undulations (images 1 and 3). Occasionally a terminal undulation will coalesce with the apex, which then becomes much wider and obtusely rounded (images 2 and 7). Distal raphe ends terminate about two thirds of the way from the ventral to the dorsal margin and at some distance from the apex. Striae are radiate throughout and of two types: complete striae that extend the full width of the valve and short striae that occur only along the dorsal margin. Short dorsal striae are more frequent within the undulations, especially in smaller specimens. A fine transparent line runs along the ventral margin and ascends the valve face near the apices, where it angles towards the terminal nodules. Striae on either side of this line may be continuous or displaced. 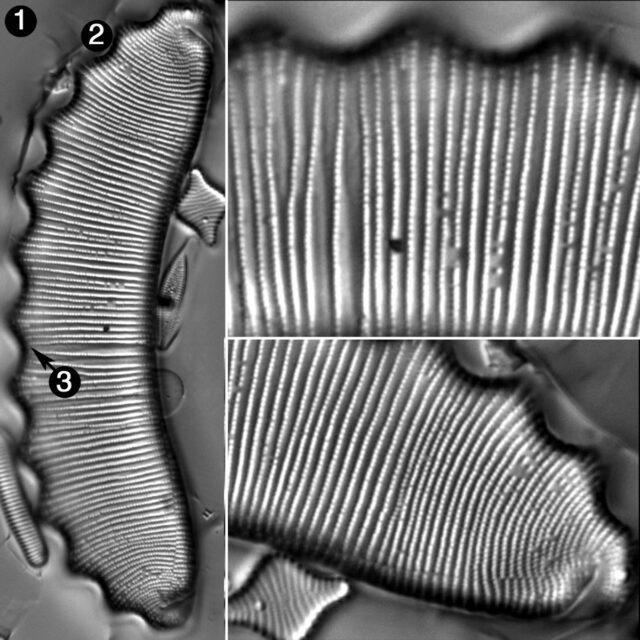 Areolae in the striae are 26-29 in 10 µm. The number of dorsal undulations in other U.S. populations ranges from 6 to 22, valve length ranges from 40 to 165 µm, and valve width ranges from 13 to 18 µm (Brant & Furey 2011, P. C. Furey, pers. comm.). Montana specimens (18-24 µm wide) are wider than these and also wider than specimens reported from Europe (12-16 µm wide; Lange-Bertalot et al. 2011). Eunotia serra has been reported from a number of lakes and bogs in the central and northeastern United States, as well as Gulf Coast states, Colorado, and California (Brant & Furey 2011, Patrick & Reimer 1966). These sites typically have acidic pH and very low electrical conductivity. Lange-Bertalot et al. (2011) report this species as a component of the Holarctic flora of Eurasia and North America. 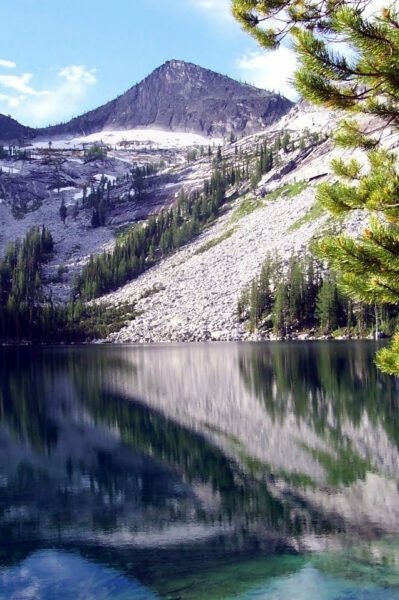 In the Northern Rockies, E. serra has been recorded from ponds and small lakes in the Bitterroot Range on the Montana/Idaho border. Here pH ranges from 5.5 to 6.5 and EC ranges from 5 to 27. Blodgett Lake in the Bitterroot Range, Selway-Bitterroot Wilderness, Ravalli County, Montana: home of Eunotia serra. Brant, L.A. and Furey, P.C. (2011) Morphological variation in Eunotia serra, with a focus on the rimoportula. 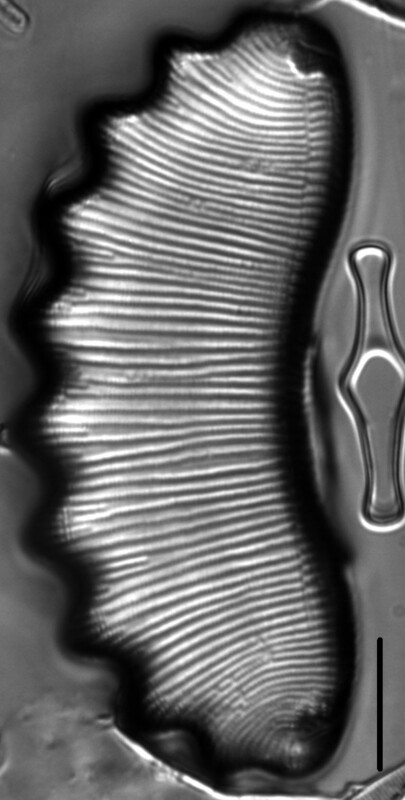 Diatom Research 26(2): 221-226. Ehrenberg, C.G. (1837) Über ein aus fossilen Infusorien bestehendes, 1832 zu Brod verbacknes Bergmehl von der Grenzen Lapplands in Schweden. Bericht über die zur Bekanntmachung geeigneten Verhandlungen der Königlich-Preussischen Akademie der Wissenschaften zu Berlin 1837:43-45. Eunotia serra has very large valves with highly arched dorsal and ventral margins. The dorsal margin has 6 to 22 bluntly pointed and evenly spaced undulations.